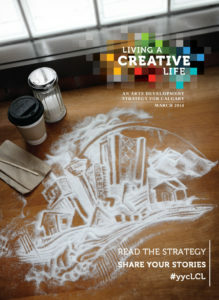 Vision: Calgary’s Centre City radiates creative energy from the core out, making it a destination for Calgarians and visitors alike. Outcome One: A wide variety of arts experiences are embedded in the Centre City, creating a dynamic, central arts hub for the city. Driver: Prioritize the creation and upkeep of purpose-built arts spaces within the Centre City. Increase communication among Centre City arts venues regarding existing models, expansion and redevelopment of sustainable arts spaces. Extend the reach of density incentives to include donations to purpose-built arts facilities. Provide financing or in-kind support for non-profit arts tenants to improve their leased facilities. Driver: Ease the process of creating arts experiences in alternative spaces within the Centre City. Broker connections between the arts and the private sector to encourage an arts presence in corporate and commercial spaces within the Centre City. Increase awareness and knowledge of municipal permitting processes to facilitate the production of innovative arts projects and events in the Centre City. Increase awareness within the arts community of purpose-built and alternative arts spaces available in the Centre City. Driver: Include an artistic element in key aspects of Centre City planning. Encourage integrated arts experiences within Centre City plans (visual art incorporated into infrastructure, spaces for street performers, etc.). Embrace the opportunity to include arts spaces where artists can live and work in new developments within the Centre City. Invest in public realm infrastructure (e.g., power sources for buskers to hook up equipment) that supports arts experiences within the Centre City. Number of available purpose-built and non-traditional arts spaces. Number nights these spaces are occupied. Total audience capacity of spaces in inventory. Number of arts events in the Centre City. Percentage of arts events held in the Centre City based on discipline. Outcome Two: Calgarians and tourists often visit the Centre City specifically to experience the arts. Driver: Provide resources to create remarkable arts experiences in the Centre City. Work with the private, public and arts sectors to coordinate resources and create remarkable arts experiences in the Centre City. Create more arts events that draw people to the Centre City during the winter months. Maintain or increase public and private sector investment in publicly accessible art. Driver: Create incentives to travel to and within the Centre City from other parts of Calgary. Increase or improve multimodal transportation options to allow Calgarians and tourists to move quickly and easily throughout the Centre City. Improve the connectivity and experience of moving between arts events throughout the Centre City. Pool marketing dollars and media sponsorships to implement a marketing strategy to bring more Calgarians to the Centre City. Number of attendees at paid and free Centre City events. Number of hotel rooms booked annually in the Centre City. Foot, vehicle and transit traffic in Centre City. Percentage of Calgarians motivated to travel to the Centre City for arts-related activity.